Let me preface this review by saying that I am not usually a jewelry sort of girl. However, I have been making the move towards being a bit more fashionable since my big weight loss and I wanted to start branching out and adding accessories to my wardrobe. When I came across the charms and charm bracelets available at Charm Factory, I was instantly attracted to their simple sterling silver designs. Charm Factory has a large variety of hundreds of different charms that can match the needs of any consumer. Their silver charms and beads are made from .925 sterling silver and are made in the USA! The company also offers charms made of pewter, 14k plated gold, crystals, stone, shells and even wood. 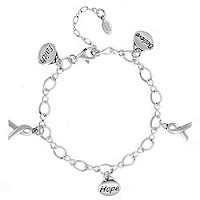 They also offer a range of finished charm bracelets as well as jewelry components, cell phone straps and chains. In addition, the Charm Factory products are also nickel and lead free. From their Twilight inspired charms, such as the Team Edward Charm and the Wooden Howling Wolf Charm to the crystal laden Pave charms, Charm Factory offers something to fit each consumer's individual needs and tastes. Silver charms are available in a wide range of categories including baby charms, photo charms, message charms, animal charms and many more. These items are all reasonably priced and there is always free shipping for orders of $25 or more. Charm Factory was kind enough to send me one of their finished charm bracelets. I chose the Awareness Bracelet, which has two awareness ribbon charms, as well as three word charms that read faith, hope and believe. I was really surprised when the bracelet arrived, because it is of much greater quality than I expected. The charms and bracelet both have a very polished finish and the engraving and detail on the charms themselves is great. I love that the bracelets come in a "one size fits most" universal size so there is no guesses which would be the best fit for you. There is a strong lobster clasp included that was easy enough for my 10 year old to work, since I broke my hand and cannot do it for myself. There is no pinching from the links of the bracelet and I have worn it for at least half a dozen days and it is just as bright and shiny as when I first put it on. The only thing that was a little tiresome, was the constant clanging of the charms against the keyboard when I was typing, but I fixed this by loosening the bracelet and pushing it further up my arm and away from my wrist when using the computer. Other than that, I love my new charm bracelet and with the choices available, they would definitely make a great gift idea for any sort of event and they go with anything. You can buy individual charms, finished charm bracelets and other accessories all on the Charm Factory website. They are very affordable and discounts are give for bulk orders, plus free shipping for all orders over $25. Charm Factory has generously offered to give one lucky winner a finished charm bracelet of their choice. This is a $24.99 value! This giveaway will end on July 27, 2010 at 8pm EST and one winner will be chosen via random.org at that time. The winner will have 48 hours to respond or another winner will be chosen. Open to US residents 18+ only. In order to enter this giveaway, you must visit the Charm Factory website and comment here about what finished bracelet you would choose if you won. * I was given a Charm Factory bracelet to review, but was not compensated for this post in any other way. The thoughts, words and opinions expressed here are entirely my own and were not influenced by anyone else. I would choose the Awareness Bracelet! I wish they would do an already made all butterfly charm bracelet and necklace! I would choose the bracelet with garnet hearts. I too would have to pick the Awareness Bracelet for my MIL as a brilliant gift or the Peace Bracelet for my niece since the Peace Sign is all the rave for kids her age now! THX! I like the silver star bracelet. I would get the Breast Cancer Awareness bracelet! In memory of my momma! I like the peace bracelet. Very cute. I would choose the Joyful Colors Swarovski Heart Bracelet. I love the Aquamarine Crystal Heart Charm Bracelet! Like Charm Factory on Facebook and told them you sent me! Entered your Orglamix makeup giveaway! I like the Amethyst Bracelet with Crystal Hearts! I'd choose the one with the silver stars on it! I like the Peridot heart bracelet. I would pick the Peace Bracelet! I like Charm Factory on FB and let them know you sent me! I want the bracelet with the red garnet hearts. I'd pick the Garnet Bracelet with Crystal Hearts. I follow Charm Factory on Twitter. Cute and Creative website!! :)Thanks for the giveaway!! Look forward to following you in the future!!! I would get the Silver Heart Bracelet. I follow Charm Factory on Twitter @kristinnw. I would love the finished bracelet for cat lovers! Follow publicly as Ally (rubymoonstone/gmail) on Google Friend. I would like the Graduation Bracelet for 2011. I love the Peace Bracelet. My daughter would love the Amethyst Bracelet with Crystal Hearts. I follow Charm Factory on twitter, nikkidavis05. I am an email subscriber, entry 1. I am an email subscriber, entry 2.